The project, called Project Playhouse, is a one-day event that unites business and organizations in the Toledo-area for one purpose: “to build a blessing in a child’s life.” The goal of Project Playhouse is to “provide a secret world where kids can create make-believe and dream.” Throughout the course of one day, 30 teams of volunteers built a playhouse from scratch for 30 families in Lucas County, Ohio. Each playhouse takes 5-6 hours to build and paint. The materials are pre-cut to allow for easy planning. Volunteers assemble doors, windows, trim, roofing, and then design and colorfully paint the completed structure. Not only does each playhouse provide an exciting place for kids to play, but sponsorships of the playhouses starts at $3,000. The proceeds will go towards the construction of one Habitat for Humanity house in the Toledo community in 2018. Paul Best, Marketing Coordinator, says, “Seeing everyone come together for a common goal was inspiring, and to know that you are providing a service that you could see the family benefit from, meant everything. It was a fantastic experience that MR Direct was grateful to be a part of. " 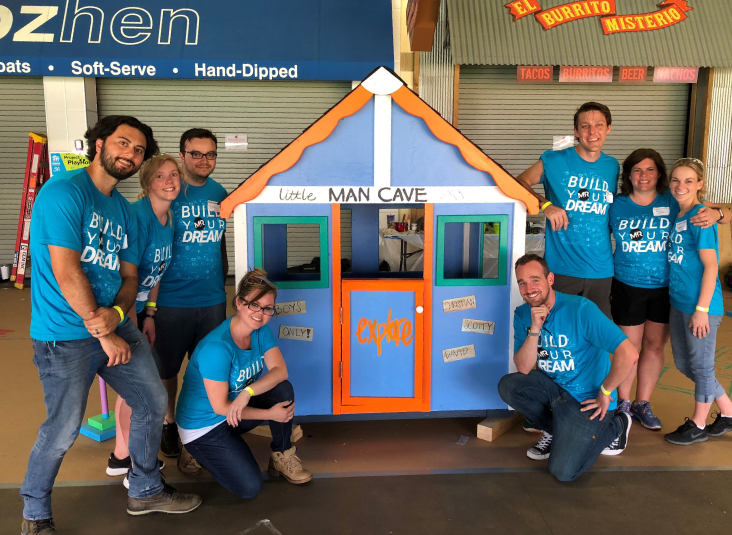 MR Direct would like to extend a resounding “thank you” to Maumee Valley Habitat for Humanity for the opportunity to take part in Project Playhouse. We can’t wait to partner together again in the future because the greatness of a community is most accurately measured by the compassionate actions of its members.